A computer virus is a program that can duplicate itself and easily spread from one computer to another, destroying important files and often damaging your computer. The sad thing to know is that in most instances you’ve actually installed the virus yourself because they often hide within browser plug-ins, programs and downloads. The term Malware is often used in conjunction with the term virus. However, in actuality, a virus is just a type of Malware. Malware is defined as any software designed to cause damage or disturbance to a system, including mobile devices, computers and computer networks. Did you know that the most common way Malware gets spread is through drive-by downloads that are found on many web pages today? A drive-by download is a program that automatically installs itself into your system when you visit a Web page. These drive-by downloads infect your system by manipulating flaws found in your browser and operating system code. Many people believe that when their computer displays an error message, this means they have a virus. In reality, many other things such as bugs in software, an inadequate hard drive, memory issues or a problem with your virus scanner could cause this. People also assume that when their computer crashes it’s due to a virus, but in actuality this can happen because of something completely unrelated to a virus. Nevertheless, it’s always a good idea to scan your computer for viruses when error messages or computer crashes occur so you can rule out viruses or Malware as a possible cause. Many people bring their computers to a repair technician claiming that a virus installed itself and automatically infected their computer system. But in reality, computers cannot infect themselves with a virus. If your computer has a virus, it’s because you’ve physically opened something that had an infected file, or you visited a website hosting a virus and unknowingly opened it. The best way to avoid this is by abstaining from using or opening websites that contain illegal or ‘adult’ content. These websites are not just limited to ‘adult entertainment,’ but also include torrent sites that offer free downloads. Many people believe that the worst viruses and Malware infect systems running on a Windows operating system. They think that systems such as Apple’s OS X will remain virus free, but this isn’t true. 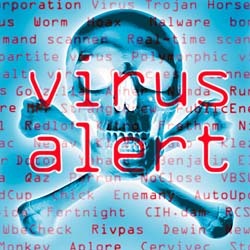 Any and all systems have the capability of being infected by viruses or Malware. Typically more viruses are written and formatted to target Windows operating systems. However, threats are increasing as systems like OS X and Linux become more popular. Many people believe that if they have a virus they can remove it by simply copying their files to a backup drive or hard drive, re-installing Windows on their computer, and then copying their files back to their computer. In some cases this is true, however, if the virus resides in the files you’ve backed up, then moving them back to your computer will only infect it again. The best way to go about solving this issue is to scan all of your computer files and make sure the virus gets eliminated before putting them back onto your system. It’s a common belief that firewalls protect computer systems from viruses. For instance, Windows comes with a built-in firewall and many users believe this protects their computer from viruses. In reality, firewalls are used to prevent unwarranted network traffic. They keep your network and computer secure while connected to the network, but they don’t scan for, or prevent computer viruses. However, if a virus begins sending data to another computer outside of your own network, then the firewall will alert you, or simply stop the oncoming or outgoing data. Some viruses are powerful enough to literally turn off your firewall. This allows Malware attacks or oncoming viruses to penetrate your computer’s network. So what can you do to protect your computer and minimize your chances of infection? The first thing to do is to install a virus-scanning program on your computer and all of your systems. Ensure it’s up to date and that you run it regularly. Don’t add programs from unknown sources you don’t trust. Stay away from Websites that ask you for your password. Don’t install browser add-on programs or plug-ins that Websites suggest. Download all add-on programs directly from the developer’s Website or directly from application stores. If you’re worried about your computer and network security, call us today. Our team of security experts will work with you to develop and implement a plan that guarantees protection from computer viruses.